Money has always been fiat whenever government gets involved. Aside from the debasements of England under Henry VIII and the Great Monetary Crisis of the 3rd century in Rome or the Great Monetary Crisis of 1092 in Byzantium, we even see attempts by city states like Florence. 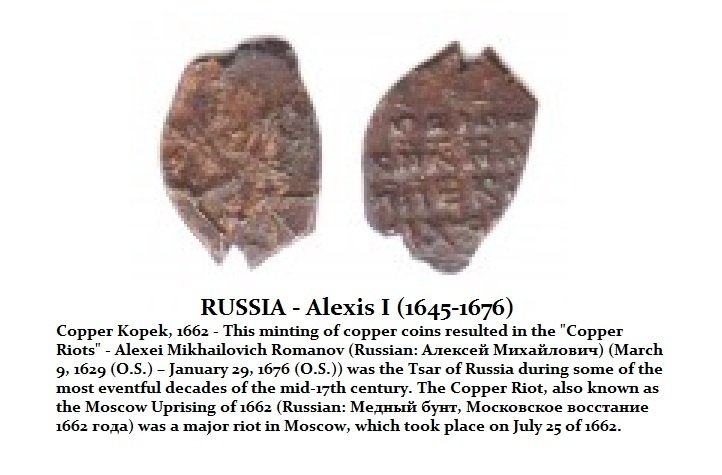 However, one of the great riots over money took place when the Russian government began producing copper coins and assigning them equal value to silver currency to meet expenses. The effort failed and silver vanished from circulation, and the entire economy collapsed. The copper money was was naturally devalued in purchasing power and then there was widespread counterfeiting operations since the official value of the copper coinage became far in excess of the cost of production.The economy collapsed into a deflationary black hole as businese collapsed and unemployment rose dramatically. This erupted into what has become known as the Copper Riots of 1662. Tensions peaked when a black list of persons accused of being responsible for the economic slump was posted, and, though its authorship was unknown, it associated many prominent aristocrats and merchants with Poland, a nation whose Catholicity was considered sinister. At least 10,000 protesters gathered and marched to Kolomenskoye, which was the residence of Tsar Alexei Mikhailovich.. They now demanded that the ‘traitors’ be turned over to them. The Tsar, like politcians today promised to investigate and also promised to reduce the taxation. Nevertheless, the mob was satisfied with the political promises as is often the case. They they began their journey back to Moscow. However, back in Moscow, other rioters were destroying and looting the property of hated merchants the people assumed were responsible. The two groups merged and this time returned in greater number to confront the Tsar and make more demands. The Tsar was now prepared and called in 10,000 troops who were ordered to suppression the crowd. Over a 1,000 protesters were brutally killed, quelling the mob, and many thousands more were later convicted and exiled or hanged. « Will Syria be the Start of World War III in 2014?